Over the last Summer period, many of us in the library would gather together in the Media Commons to watch a short TED Talk, and discuss it afterwards. What did we learn? Was there anything surprising or particularly resonant with our work lives? Did we agree with the premise of the speaker, etc.? 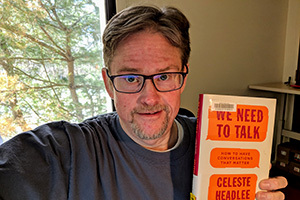 Now, the book I am currently reading originally started as a TED Talk by Celeste Headlee – “10 Ways to Have a Better Conversation”. Headlee’s is a name you may be familiar with from Public Radio International, where she has been a host for a decade or so. Headlee’s focus on improving our conversational chops interests me greatly. Conversational style and form is at the heart of the study of the eighteenth century, a subject I continue to study. More than this, though, we’ve become a nation of individuals who cannot, or will not, have conversations with each other about all sorts of matters. As individuals, we put off having difficult conversations, until the situation becomes, well, if not unbearable, then, certainly, less than enjoyable. How do we have better conversations? A lot has to do with our mindset, and our mindfulness… are we present in the conversation, or do we have our heads in our phones or laptops? Are we listening to our interlocutor, or are we formulating our reply in our heads? Do we have empathy and care for the person with whom we are speaking? Or, are we thinking about how one thing they said reminds us of something that happened to us and, well, we just have to share it? Can we be silent and still be with another person? These are the sorts of questions Headlee addresses in her TED talk, and in We Need to Talk… if you’re at all curious about the subject, listen to the TED Talk, and check out the book.